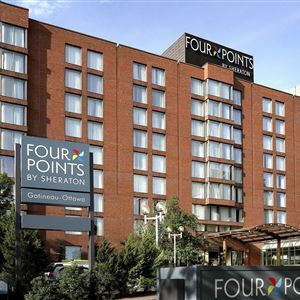 Property Location Centrally located in Gatineau, Four Points By Sheraton Gatineau-Ottawa is minutes from National Gallery of Canada and Parliament Hill. This eco-friendly hotel is within close proximity of Canadian Museum of History and Jacques Cartier Park. Rooms Make yourself at home in one of the 201 air-conditioned rooms featuring refrigerators. Your room comes with a pillowtop bed. Complimentary wired and wireless Internet access keeps you connected, and cable programming provides entertainment. Private bathrooms with showers feature complimentary toiletries and hair dryers. Amenities Don't miss out on recreational opportunities including an indoor pool and a 24-hour fitness center. This hotel also features complimentary wireless Internet access, concierge services, and a television in a common area. Dining Grab a bite to eat at the hotel's restaurant, which features a bar, or stay in and take advantage of room service (during limited hours). Quench your thirst with your favorite drink at a bar/lounge. Buffet breakfasts are served on weekdays from 6:30 AM to 11 AM and on weekends from 7 AM to 11 AM for a fee. Business, Other Amenities Featured amenities include a 24-hour business center, express check-in, and express check-out. Planning an event in Gatineau? This hotel has facilities measuring 459 square feet (41 square meters), including conference space. Self parking (subject to charges) is available onsite. 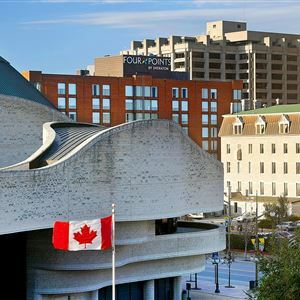 Centrally located in Gatineau, Four Points By Sheraton Gatineau-Ottawa is minutes from National Gallery of Canada and Parliament Hill. This eco-friendly hotel is within close proximity of Canadian Museum of History and Jacques Cartier Park. Make yourself at home in one of the 201 air-conditioned rooms featuring refrigerators. Your room comes with a pillowtop bed. Complimentary wired and wireless Internet access keeps you connected, and cable programming provides entertainment. Private bathrooms with showers feature complimentary toiletries and hair dryers. Don't miss out on recreational opportunities including an indoor pool and a 24-hour fitness center. This hotel also features complimentary wireless Internet access, concierge services, and a television in a common area. Grab a bite to eat at the hotel's restaurant, which features a bar, or stay in and take advantage of room service (during limited hours). Quench your thirst with your favorite drink at a bar/lounge. Buffet breakfasts are served on weekdays from 6:30 AM to 11 AM and on weekends from 7 AM to 11 AM for a fee. Featured amenities include a 24-hour business center, express check-in, and express check-out. Planning an event in Gatineau? This hotel has facilities measuring 459 square feet (41 square meters), including conference space. Self parking (subject to charges) is available onsite.